We track millions of social media posts and use machine learning to determine sentiment for hundreds of cryptocurrencies in real-time. Below is real-time sentiment of tweets for Bitcoin in the last period. 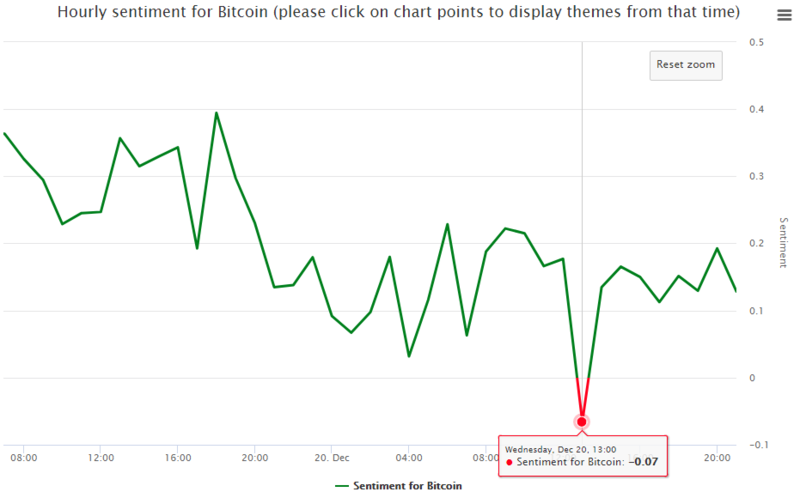 The real-time sentiment of Bitcoin had a great sentiment collapse on 20th December at 13 (UTC time). As we have already posted in other such cases in the past this means a major warning and bearish signal for the price and indeed the price of Bitcoin has since then fallen from around 18.000 USD to current price of 15.500 USD for a negative return of almost 10%. [Edit: since writing this post on 21th December the losses of Bitcoin extended with price falling below 12000 USD so we avoided even greater negative returns of over -30% with the use of our sentiment data. ] Our sentiment was again proven outstandingly correct – read more about many past great trading signals like this in our blog posts. And you can start profiting from it immediately by subscribing to our platform at www.bittsanalytics.com.